I have to say I never thought I would be writing this blog post. 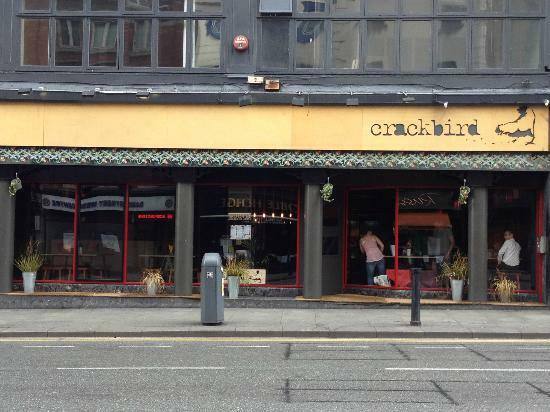 I never thought I would actually darken the doors of Crackbird as it never seemed like a place I could like. I have no trouble in saying I am a normal bloke, and always thought going to Crackbird would be like hipster heaven, I certainly haven't the legs for skinny jeans. Having been to one of Joe Macken's restaurants (creator and mastermind behind Joburger, Skinflint and BEAR) that being Joburger in Rathmines long ago with Joanne, I did at the time like it but Joanne wasn't a fan at all because of the cramped seats and loud music. So maybe I thought ok all of Joe's places are like this and I decided to give them all a skip for the past 3 years. 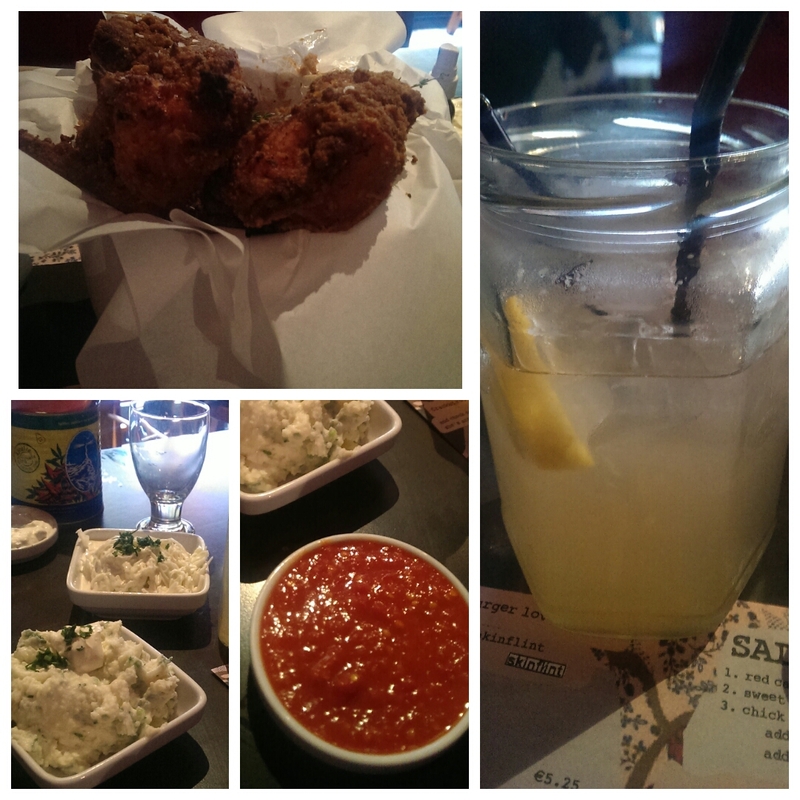 Until 3 weeks ago when I met up with some friends and one of the girls suggested going to Crackbird. It was finally my chance to see what all the fuss was about, the fuss of tweetseats etc that has along ago died down and has left Crackbird one of Dublin's most popular restaurants on one of the city's busiest streets. When we arrived, my friend who had made the suggestion advised us on what to get so she made the order with us making our own drinks order. We decided upon half Soy Garlic Chicken, half Buttermilk Chicken, potato salad, coleslaw, chipotle baked beans, srirracha sauce, chermoula sauce and burnt lemon with whipped feta dip. Well...... IT WAS AMAZING, dear god the chicken alone was intense and so good especially the Soy Garlic, I could have eaten a bucket of it alone. All the sides were tasty and I even finally got an introduction to srirracha which I had been meaning to have for so long ( I have since bought a huge bottle in the Asian Supermarket over on Drury St.). The chicken really is the star of the show, and yes people can draw the comparisons to KFC which they do, but Crackbird blows KFC out of the water hands down. The entire meal was delicious and I washed it down with the most tastiest drink I have had in so long, which is rhubarb lemonade. I used to hate rhubarb as a kid, despised it in fact, I remember my mum would make rhubarb tart every so often and I would dread it. Now however I can't get enough and in a drink too! I am sold. In that I am sold on rhubarb I am also very much sold on Crackbird. It ticks all my boxes, in fact I recently heard Niall from LovinDublin say on his blog, that if he goes in to a restaurant with a 100 points mentally and takes away points for all the negatives in a restaurant, food, service etc. Well being honest I don't think I can come away from Crackbird with many negatives, it makes me believe that sometimes you need to do things and go places to form your own opinion. The staff in Crackbird are top notch, helpful and efficient, the food is tremendous and of course not forgetting the music, it rocks!!! we were treated to the Beastie Boys and Jimi Hendrix for most the night. I definitely recommend going to Crackbird from a serious skeptic who has since changed his mind. Below are some pics from my lunch today, yup I have been back for my second visit and I can confirm the experience was the exact same, bang on the money as my first visit.